It’s finally kit release day for Habit Forming over at Feed Your Craft! Can you tell I’ve been a little excited about this one? I can’t help it - I really love this kit - the white space, the color, all of it, but it’s also that time of year that I’m ready for change, for intentional steps, and this kit is perfect for that. One of my favorite parts about this kit is that the floral stamp can also be used as a habit tracker! Yep, stamp a garden of flowers on your cards, layout, or in your journal, and bring a little life that’s fun to color, or use it to mark daily habits by filling in one of the 30 petals or 30 leaves each day, and on months with 31 days, add a lady bug for luck and color her in, too! There’s a handy-dandy PDF that will come along with your digital files to give you more information and remind you about this option. And while we’re on the subject of not forgetting, remember all physical kit orders get the digital files for the cards and stamps, too! I used the digital form of the stamp to create a little tracker for the first six months of the year, printing it off on transparency that I’ll clip into the front of my albums and color in as the year progresses. Speaking of albums, I am using the new year as a nudge to get back on track with my memory keeping, and to do that I’m also changing things up a bit. I’ve culled together all of the albums and binders I’ve been hoarding all these years - some made for these kind of projects, some not, some (very) old, some new, big, little, thick, thin, and I am going to use them, one for each month, to tell my stories. There are limitations to them, sure, but I am excited about what that will mean, and I am so ready to use kits like Habit Forming to make it happen and think outside the box. Some of these have classic page protectors, others have random papers, or nothing at all, and one was even an old Swedish cookbook, brimming with so many clippings, and I plan to work within and around and through all of it. Imagine if my most creatively collected commonplace books (see here for more info if that’s new to you) had a baby with my Project Life albums. I honestly can’t wait to see what happens. I am ready to be a beginner again, and the start of 2019 is the perfect nudge to get it going. And, even though all the surfaces I normally use for videos are currently covered in Christmas decorations, I created a makeshift set up that would make Santa chuckle, and did a rough, but full of love unboxing video of the full kit just in case you’d like to see the pieces in action. You can grab your kit in the shop, and I am sending you so much love and thanks for your continued support! It’s one of my favorite signs that the holidays are here…12 Tags of Christmas (with a feminine twist). I also love it because I get to pair with the always lovely and talented Julie Ebersole. This year our theme is taking us away from traditional Christmas colors, and we’re mixing it up a bit. I stretched this a little bit with a mint, pink, and a bold orangey-red (yes, I know, shades of red and green, but I’m standing behind them as being different enough from the norm, and honestly, once I stamped them, I was too in love not to continue). I used the Over the River stamp set and dies, Classic Block Alphabet dies, and some of my new favorite Catherine Pooler inks to stamp patterns and cut away. And, because pattern making with stamps is quite addicting, I used a branch stamp from the same set to make a corresponding mint wrapping paper to go with my tag. Make sure to visit the Ellen Huston Blog to see more of tags, as well as Julie’s incredible creation! The newest Leading Ladies are here! Just in time for the coziest season, and the flurry of the season gift giving, the Bookworm Lady and the Holiday Shopper Lady are ready to join our current collection in the Ellen Huston shop. Plus, as a bonus this release, there’s an extra accessory set, Ugly Sweater, and it’s perfect for both adding a little something to the Ladies’ sweaters, but also for creating fun patterns, and two dies to help you create the perfect autumn and winter scenes for your new friends. I used the Bookworm Lady set to create an interactive card with a removable bookmark and markers, perfect for some of my creative young bookworm friends. The Holiday Shopper Lady is ready with her list and pile of presents, but I think to think she’s a bargain hunter at heart, so her smile is all about the great sales she found while looking for the perfect gift. 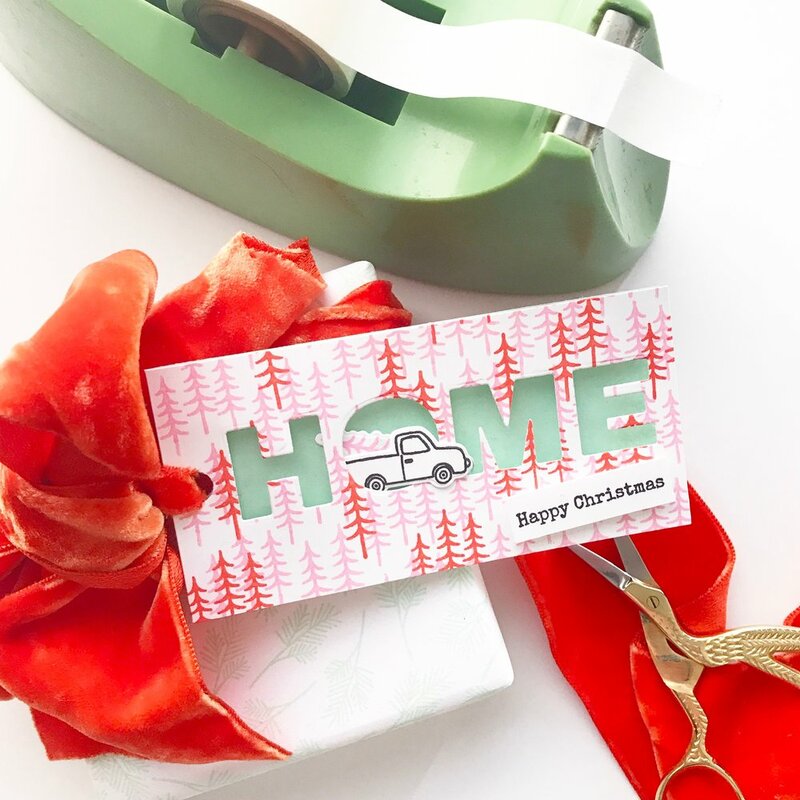 I was up on the Ellen Hutson blog this past week sharing all the fun tags I made using the Ugly Sweater accessory stamp set, but I’d be remiss if I didn’t share another here. Love grabbing older Essentials by Ellen dies to pair with new stamp sets. This joy die is no longer available, but you could easily make something similar with their amazing alphabet set! I’ve got more card designs to share soon, but for now, hop on over to Ellen Hutson and grab the new release for yourself! Although I always say I’m not ready for Christmas yet, there’s always a lot of merriment when the October Feed Your Craft kits release because they’re full of so much cheer that it’s hard not to feel a bit of the magic. The kit I designed this year, Made Merry, is definitely heavy on the cheer, with bright colors, a mix of tradition and whimsy, and lots and lots of inspiration from holidays past, it’s sure to make you smile like this little Santa. I mean, talk about jolly. I also couldn’t wait and started playing with the kit right away, creating my annual wish list for the season. I took a different spin this year, with a Less/More list, and I kind of love it. I also used a mixture of the physical and digital elements to create this insert where I can list the mail I’ll be sending in December. I really can’t get enough of that mailbox stamp! The kit comes in both physical and digital forms, but don’t forget that when you purchase the physical kit, you get the digital files, too! You can grab yours in the Feed Your Craft shop today. Thank you so much for the love and excitement you’d shown this kit already!